Last month marked my first visit to Phoenix, Arizona. I was visiting a friend who I have not seen in a while, and he was showing me all of the different cuisine that is offered in Phoenix. Phoenix is by no means small town, so there were a lot of restaurants that we had to try. I was there for a week, after all. After returning, I am disappointed by the food in my hometown. So I’m going t reflect on the experiences I had in Arizona. The best restaurant that we tried was Little Miss BBQ. It was my friend’s personal favorite, so that had to mean something from the get-go. Also, I read a lot of the positive online reviews while we drove there and I was not disappointed. 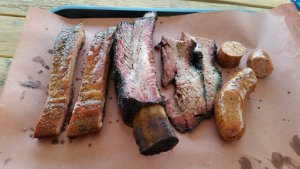 Little Miss BBQ is located near Rayburn Acres in Phoenix. The restaurant itself is only a block or two away from the Salt River, so if you’re into scenery then this is the place for you. If you could find a bench, you could probably sit and eat your BBQ. My first impressions from he staff were good, as they greeted us with smiles. Although it was moderately busy, there were no issues getting a seat. It’s always nice to see a restaurant’s business flourishing, because that just means people like it. Once we were seated, there were no problems with our drink or food orders. I wasn’t sure what to get because I’m kind of picky, but I was surprised at how many different options there were on the menu. There’s a different kind of barbequed meat for all people out there. Even if you’re jewish and can’t have pork. For those of you who are trying to eat healthier, Little Miss BBQ also serves turkey. Less fat in the meat. As we waited for our food, I made sure to take in the sights and atmosphere. There’s no music blasting overhead, so this restaurant is already a few steps ahead of a certain Roadhouse named after a state. Little Miss BBQ has a very attractive interior, and the natural lighting from the windows really made it stand out. Nobody wants to be in a cold, damp cave. Unless they’re a bat, or a mushroom. My friend and I didn’t have to wait for very long before the food arrived, another pro to add to the list. There wasn’t very much fat on the meat, even for pork. 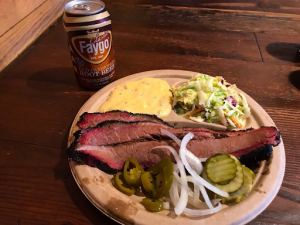 Brisket is either done really poorly at restaurants, or it is done very well. Little Miss BBQ’s meat falls into the latter category, which is likely why my friend likes it so much. One thing restaurant owners need to take into consideration when managing a BBQ restaurant is the kitchen’s level of grease. Grease is almost impossible to see as it evaporates, and only really appears once the kitchen’s grease trap catches it. My friend works for some reliable restaurant hood cleaners in Phoenix, so I’m sure he as slipped the restaurant owner’s his number at some point. From what my friend told me, the business provides commercial kitchen equipment cleaning in addition to the standard hood cleaning. Might as well clean the other equipment while they’re already there, right? He told me to read the about page if I was still curious about any other aspects of the business. I’ll have to do that sometime. There is not a doubt in my mind that Little Miss BBQ is the first restaurant I will visit upon returning to Phoenix. However, the other restaurants that I’m going to review do provide some stiff competition. Next up, there’s El Chino Restaurante Y Cantina. 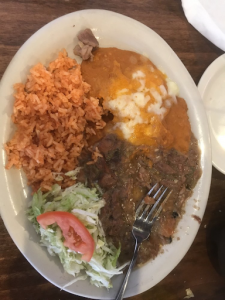 I’m a sucker for good Mexican food, and the food from El Chino Restaurante Y Cantina is no exception. 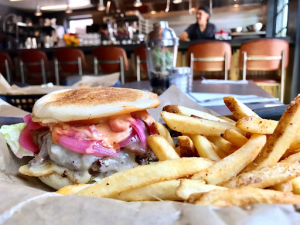 This time around, you will be eating in the warehouse district of Phoenix. There’s no problem with that, and it’s not terribly far away from the more residential areas of town. I don’t live in Phoenix though, so what would I know? The staff here were also very friendly, and it’s hard for me to eat at restaurants with poor service now. Here, my friend and I both ordered the fish tacos. My mom introduced me to fish tacos when I was young, so it’s kind of a nostalgic thing for me. El Chino Restaurante Y Cantina has no shortage of great reviews, either. It’s a good thing that my friend didn’t just try to goof me and take me to bad restaurants, just to see if I would notice. The food here was excellent, and I’m not sure if I will be able to order anything else next time. Does ordering the fish tacos twice count as ordering another dish? Last but not least, the last Phoenix restaurant we ate at. This was one the final night, so I was expecting some sort of large final climactic dinner. There were no fireworks or tears, but the restaurant was still really great. The Dressing Room is located right in downtown Phoenix. Downtown Phoenix has so many different attractions that I can’t name them all. My friend and I saw a movie, so that’s one thing you can do. There’s shopping and all sorts of other things as well. The Dressing Room specializes in both tacos and burgers, but I decided to order a burger since I had eaten fish tacos the previous night. Someone behind me had a churro ice cream sandwich, and that sounded really amazing. I didn’t have room after my burger, but next time I am definitely going to order it. I ordered the RoRo burger, only because all of the amazing online reviews that I read praised it. The only dish that got anywhere near as many compliments was the burrito. Top-notch service and cleanliness added up as well, and it’s tough for me to decide exactly which restaurant in Phoenix is the best. On the plus side, that just means I have to keep coming back until I make a decision, right?